Treatments should be completed at least two weeks before the racing season begins. Feed your pigeons according to the training work: a lot of training flights = high energy = need of high energy feed. Our recommendations are optional. 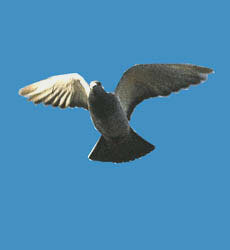 You should change them depending on the difficulty of the flight, the pigeons' performance, the feed given to them. Do not administer different products simultaneously before a race because of unknown interactions. The better way is to test them during the training flights. It is very important that pigeons drink as much fresh water as possible, before basketing. Blood thinning effect. Most of supplements given via feed or drinking water, before basketing, make them thirsty during flight.